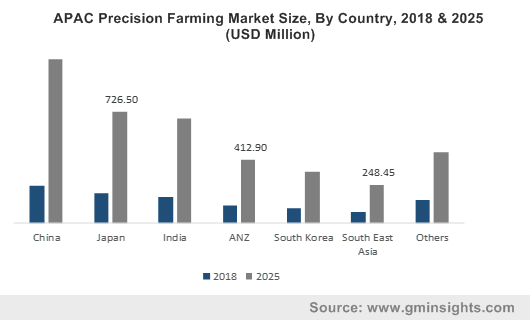 Precision Farming Market size in 2018 was over USD 4 billion and is estimated to grow at around 15% CAGR from 2019 to 2025. The precision farming practices are expected to witness a surge in the adoption as they enable farmers to accurately manage variations in the field, increase productivity, and reduce production costs. These practices help to gather relevant information by analyzing the real-time data about the conditions of the soil, crops, and local weather predictions and provide actionable insights to farmers with directions about the soil management, crop rotation, harvesting time, and optimal planting time. The precision farming technology is gaining popularity in the agriculture sector as it holds the potential to increase crop yield by using advanced IT-based agriculture methods. Rapid use of the IoT in the agriculture sector is contributing to the growth of the precision farming market. Farm managers & producers are leveraging the capabilities of the IoT devices, such as sensors, GPS & GNSS systems, and automated steering systems, for soil sampling, temperature monitoring, filed mapping, irrigation management, and several other applications. These devices provide real-time insights on how to improve farming practices for greater efficiency. The growing uptake of drone technology for crop monitoring, identifying planting flaws, and pest & disease control & detection will also lead to the market growth. For instance, in May 2017, QuestUAV introduced DATAhawkAG all-round package for the precision agriculture mapping. When equipped with MicaSense RedEdge camera, the Q-100 DATAhawkAG helps to capture images in five discrete spectral bands and detect patterns co-related to plant stress and nutrient content. 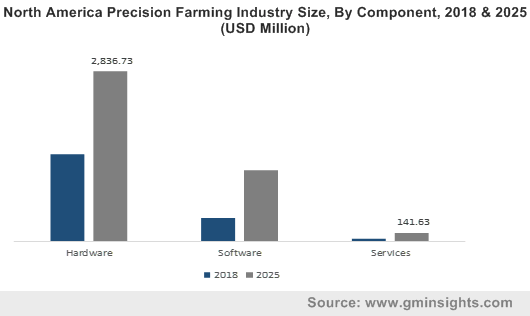 In the precision farming component market, the hardware segment is expected to dominate the market in 2025 with a share of above 70% due to the huge installation of devices including sensors, smartphones, cameras, and UAVs. These devices can be installed on various types of farming equipment such as tractors and harvesters. The penetration of the precision farming technology will compel vendors to introduce new hardware devices with better location & data processing capabilities. In this segment, sensors will dominate the precision farming market in 2025 with a share of over 18%. Farmers and researchers are deploying sensors, which will help them in better monitoring their crop health. The players operating in the market are introducing advanced sensor-based products, which can provide quantitative metrics about the crop health. For instance, in March 2017, SLANTRANGE Inc. introduced a new 3p multispectral sensor system for agricultural drones, which provides quantitative metrics about the crop’s health and enables growers to effectively scale their operations. 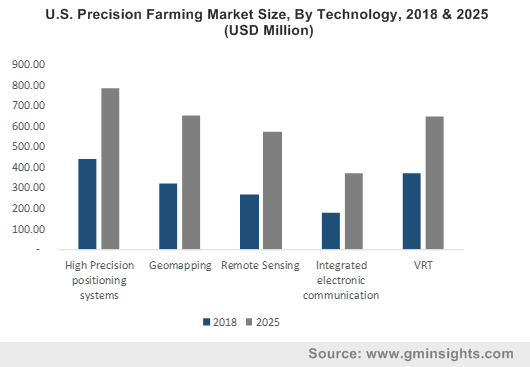 The high-precision positioning systems held a dominant share of over 27% of the precision farming market in 2018 due to the extensive use of GPS and GNSS systems. These technologies are widely used to determine & process location-based data. Moreover, precision farming technologies employ GPS to enhance the efficiency of processes and reduce the unnecessary expenditure on agrochemicals, fuel, and seeds. In addition to the spatial data provided by GPS, the technology along with the farm management software can be utilized for inter-vehicle communication and automated record keeping. The yield monitoring application segment held a major portion of over 24% of the market in 2018. The yield mapping systems make use of different types of sensors, such as grain moisture sensors, grain flow sensors, and header position sensors along with GPS antennas & receivers, to collect relevant crop-related data for optimal planning and crop management. The field mapping precision farming market is projected to grow at a CAGR of over 16% during the forecast timeline due to the increase in the use of GPS & GIS systems, which will help to gather real-time data and enable the analysis of a huge geospatial data set. These systems facilitate field mapping, soil sampling, and farm planning and help farmers to adopt effective soil or plant treatment strategies, increasing farm production. 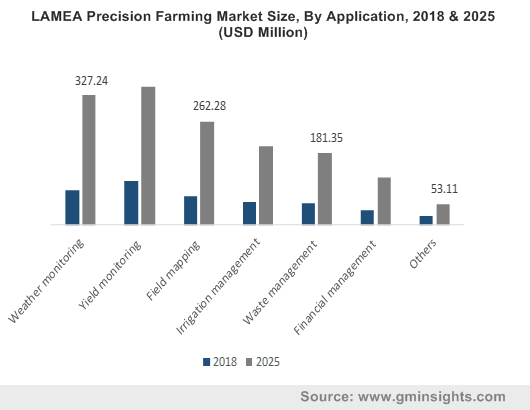 The North America precision farming market is expected to hold a market share of over 32% by 2025 owing to mechanization and heavy dependence on technology for aiding agribusinesses. The factors that are backing the market growth in the region are estimated to be the increasing awareness about the quality of crops and the introduction of new initiatives to bring innovations to the sector. The federal government also passed the Precision Agriculture Connectivity Act in 2018 to meet the connectivity needs of the precision farming in the U.S. The regulatory body established a task force, which investigates and provides policy recommendations on how to improve the broadband internet access in croplands. 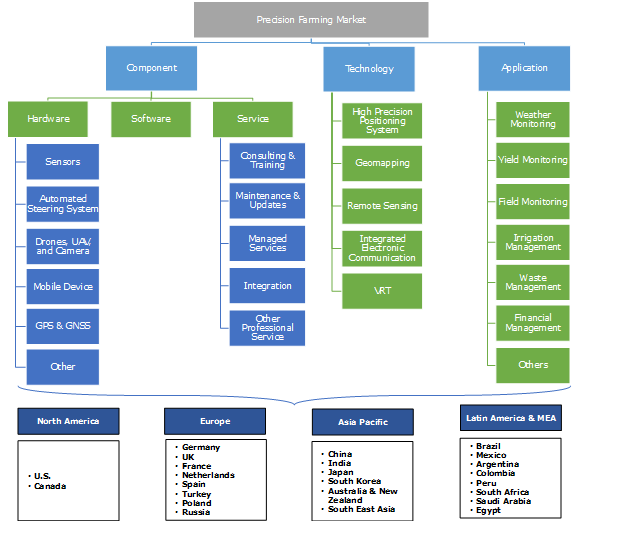 Some of the leading vendors of the precision farming market are Agribotix, LLC, AgSense LLC, Boumatic LLC., AGCO Corporation, CropMetrics LLC, AgSmarts Inc., Deere & Company, Dickey-John Corporation, Delaval Corporation, Farmers Edge Inc., CropX Inc., GEA Group AG, Monsanto Company, Precision Planting, Trimble Navigation Limited, Raven Industries Inc., and Topcon Positioning Systems Inc. The companies operating in the market are adopting strategies, such as collaborations and acquisitions, to diversify their product portfolio and gain more market share. For instance, in September 2017, AGCO completed the acquisition of Precision Planting LLC equipment business from The Climate Corporation, a subsidiary of the Monsanto Corporation. The acquisition was intended to acquire and further develop Precision Planting’s capabilities to provide innovative & practical solutions for solving customers’ farming challenges. The acquisition also strengthened AGCO’s position as a full-line partner for growers globally. Some precision farming vendors are expanding their distribution network to cater to a wider customer base in collaboration with other players having strong regional presence. For instance, in March 2017, Deere entered into a channel distribution agreement with Agri-Trend Group of Companies. Under the agreement, Deere dealers will help farmers to implement new technologies by leveraging Agri-Trend’s knowledge base. Precision farming practices started in the early 1980s when farmers used the GPS technology and yield monitors to gather & analyze crop-related data. The early 1990s also witnessed a huge adoption of handheld devices, which enabled farmers to trace field boundary, record soil sample location, and make crop observation. However, farmers and researchers faced several challenges related to the gathering & processing of huge data. This resulted in the adoption of smart technologies, such as the IoT sensors, drones, and mobile devices, for gathering real-time data to increase the farm productivity. The growing penetration of AI and Big Data analytics will also contribute to the precision farming market growth over the forecast period.